47,504 Communities Now Have Websites! Free? Yep, free. Really. Lots of features. No catch. Your website is simple to set up and easy to use. Connect your neighborhood, HOA, or organization today! Little Black Tail Ranch HOA in Careywood, ID is a small community of 61 homeowners nestled in the trees on the gentle slope of Little Blacktail Mountain in Northern Idaho. Little Black Tail Ranch has done a great job utilizing all of the tools that Neighborhood Link provides. Already have a website with another provider? 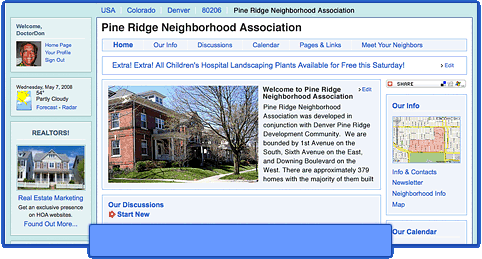 Want to make it easier for your residents and neighbors to find your website? Then join the Neighborhood Link Network, the most comprehensive listing of HOA and Neighborhood Associations in the US. It's free to join. Just provide us with your HOA or neighborhood name, your website address, and your city and zip code. We'll provide a free link to your website on all of our city and zip code pages. Email us to join! Get free, no-commitment quotes from from the largest nationwide network of property managers! How To Collect Delinquent HOA Dues! 5 Reasons To Fire Your Property Manager!